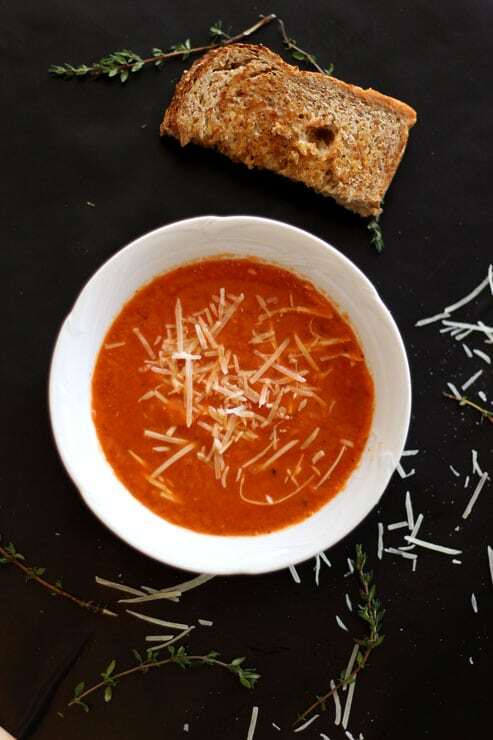 This Tomato and White Bean Soup with Grilled Cheese Dippers is perfect for the kiddos. It’s dairy-free and gluten free! This one takes no more than 30 minutes, start to finish! This one is for the kiddos…well ok, it can be for adults too! My son loves tomatoes, which is weird because no one else in this house likes tomatoes unless they are cooked. My kids also love soup. I was preparing lunch yesterday for the kids and asked what they wanted. I’m guilty of offering them the same three options I offer all the time which is chicken nugget (both kids love this), chicken caesar salad (I know, what kid like this) and a bunless hot dog for my daughter and PB&J for my son. I thought to myself…it’s time to get more creative with lunch options for my babies. I mean, come on…I’m a food blogger and a recipe creator! But this is no easy task for me…no it’s not. You see, my daughter is allergic to yeast and wheat while my son and hubby can eat anything they want. I’m sensitive to wheat and dairy…but I wanted to make this recipe work for everyone. Sandwiches are just out of the question for my daughter…I can’t find yeast free bread anywhere, but she loves soup. 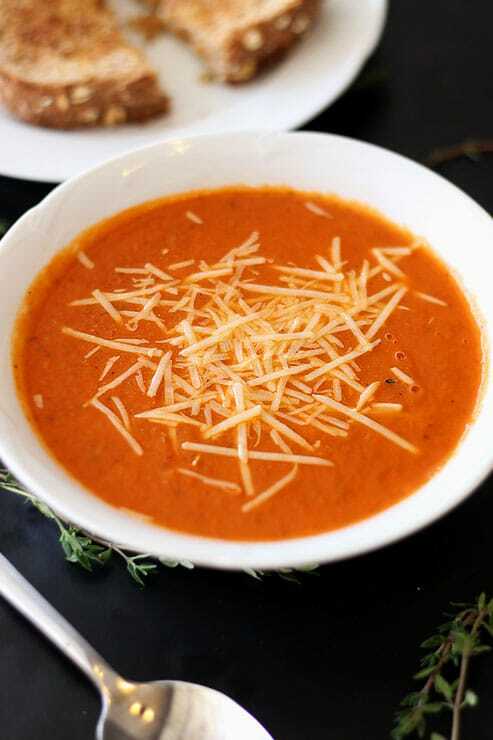 I love soup, but I can’t do the dairy…so I decided to make a cream based tomato and bean soup with grilled cheese dippers. Confused yet? Didn’t I just tell you there are wheat and dairy allergies with us?! Hang on…there is more. 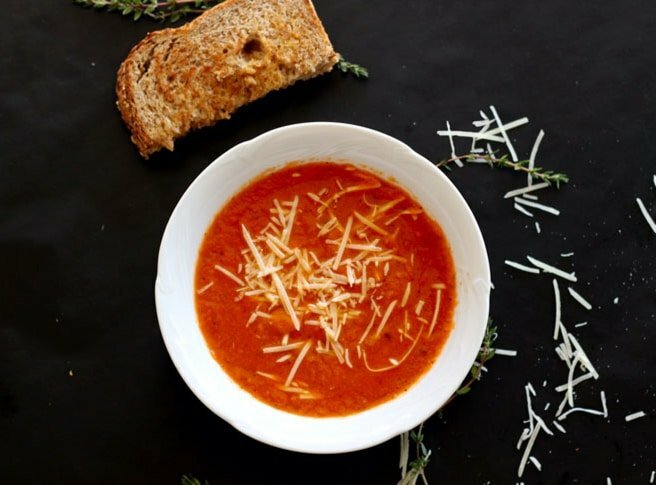 This creamy tomato and white bean soup has no dairy (unless you top it with Parmesan cheese…that’s optional). Deceiving, I know. So, how is this creamy soup dairy-free? Well, I’m glad you asked! It’s a creamy soup because of the blending of the cannellini beans with the chicken broth. Sounds amazing doesn’t it! So creamy and no dairy! Yeah! I love this recipe because it pretty much consists of tomatoes and cannellini beans. So I can eat this and so can my daughter. We have Van’s gluten free crackers we adore and we love salad, so my daughter and I are set. But, my son and husband will want more than just soup and they can eat whatever they want…so I thought what pairs well with tomato soup? Yep, you guessed it – grilled cheese sandwiches. But you have to make the grilled cheese sandwiches fun. And kids like to play with their food. So I told my son to dip his grilled cheese sandwich in the soup. My son loved that. So he called them, “grilled cheese dippers”. He’s so smart! If you want to make your grilled cheese dippers dairy-free and gluten free, just use a dairy-free cheese. Here’s 5 of the Best Dairy Free Cheeses. And if you want some good gluten free sandwich breads, check these Gluten Free Sandwich Bread options out! So there you have it! A new lunch everyone enjoyed! This one is gluten free, dairy-free and super yummy! It’s also really fast and easy to make! Enjoy this one! 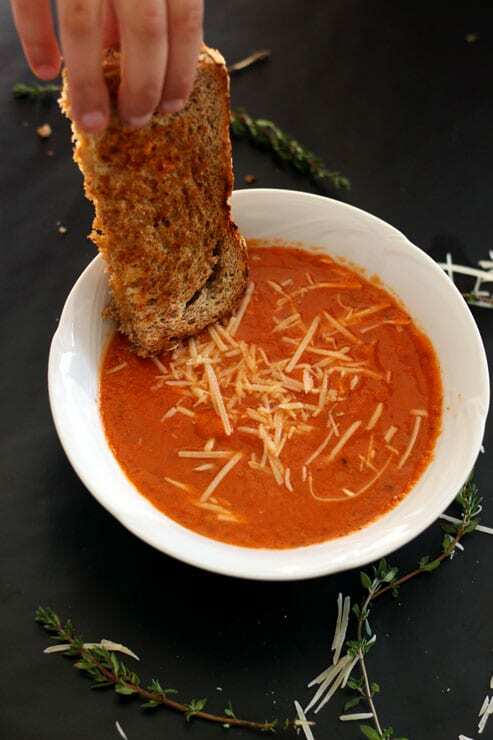 This Tomato and White Bean Soup with Grilled Cheese Dippers is perfect for the kiddos. It's dairy-free and gluten free! This one takes no more than 30 minutes, start to finish! Heat olive oil in a saucepan over medium. Add garlic and saute for 1 minute, until soft. Add tomatoes, basil, oregano, salt and pepper. Cover and bring to a boil, then lower heat and simmer for 20 minutes. Working in batches, transfer tomato mixture to a blender. Add beans and chicken broth. Puree for 2 minutes. Once well blended, return mixture to the saucepan and simmer for 5 minutes, covered. While the soup is simmering, heat a skillet over medium heat. Cover a slice of bread with cheese. Top with remaining bread and then butter the outsides. Grill in a skillet until golden on both sides and cheese is melted. Cut sandwiches in half and serve. Dip those grilled cheese dippers in the soup! 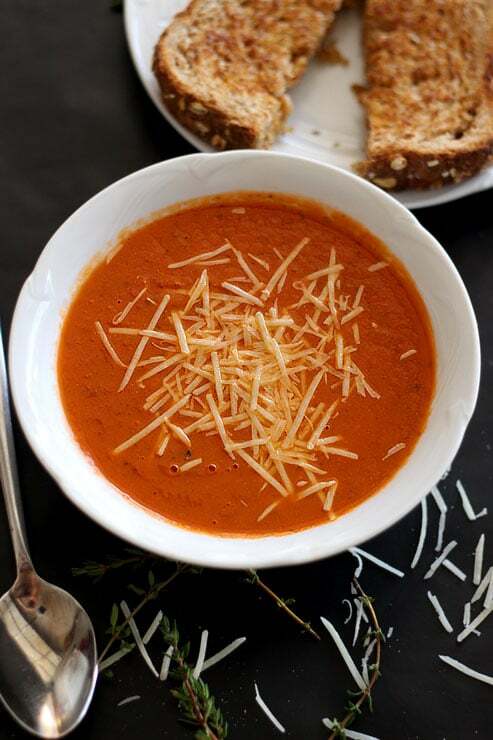 Pin this TOMATO and White Bean Soup with Grilled Cheese Dippers to your favorite SOUP or LUNCH board on PINTEREST! Oh my gosh, yum! This sounds so good. I love the addition of white beans to the soup! Thanks! yes – it’s simple and yummy!! There is nothing like a bowl of homemade soup! I love that you’ve combined two of my favorites, tomato and white bean, in this recipe. Plus, grilled cheese dippers?! You’re speaking to my heart! Will definitely be making this when the weather gets cold here. YEAH! Glad it hits home! 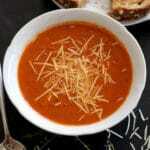 Dipping those grilled cheese sandwiches in the soup is SUPER yummy!!! I love adding white beans to different dishes – what a great way to bulk this soup up and make it “creamy”! Total comfort food! Yes, it is a GREAT comfort food for sure! !